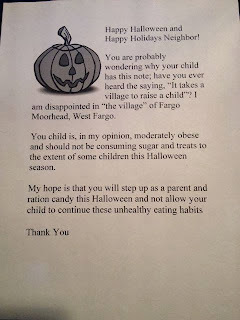 MamaBreak: Halloween Obesity Letter a Hoax?? So, a little radio station in the middle of Fargo, ND reportedly found a woman who wrote a letter to children that she felt were obese. It got TONS of media coverage from the Today show to CNN. What if I told you I thought it was a COMPLETE hoax?? Yes, that is right, I think the lady that "called in" to the radio about that letter was about as real as snuffaluffagus. Want proof? Now listen to the audio recording of their "interview" with the letter writer yesterday. Tell me those are NOT the same woman!!!!! That is the same exact person, and the deer crossing video was a COMPLETE hoax (was later found to not be real at all). Will the radio station come clean? Maybe, maybe not-- but I am pretty sure they are pulling one over on America. The deer crossing WAS, for certain made up and was a hoax. No doubt about it! I think the voices are the EXACT same, and they made up the second call as well. Pretty sad. I should add-- a hoax created by the radio station. I am fairly positive they know exactly who what woman is, and probably paid her to call in. I would not be surprised at all to learn she is a staff member there. I agree...I think its the same woman also! Me too!!! That is the same exact voice, so either she is a prank caller to the radio station, or the radio station is pranking America! We should find some way to screw over the radio station.